By Garreth Macnamee | October 7, 2010. Arthur’s Day 2010 will be remembered as a fantastic day for few, but for most of us without any tickets to the various gigs, the 23 September was just another day, an overly advertised and mass marketed day that is. Whelan’s on Wexford Street was the venue for many of Arthur’s disciples who were not lucky enough to acquire any of their messiah’s invitations. old man in style, went off without a flicker of imagination from either bar stuff or punters. Irish weather sorted that out for us no problem. sure wouldn’t it be totally un-Irish not to order a pint of Guinness. DIAGEO, who own Guinness, was laughing all the way to the bank, albeit slightly drenched. The lucky few were treated to live music by industry heavy-hitters such as Kelis, Killer’s frontman Brandon Flowers and local boys The Script. They grew up on James’s Street where the brewery is located. Among those playing away from Guinness’s heartland of Dublin were the likes of Sharon Corr and Imelda May, who played in Cork. Singer-songwriter David Gray and guitarist Newton Faulkner played in Galway. All bands present were indeed the evidence of arguably one of the greatest marketing ideas of this century. start. Alas, it was never going to materialise. 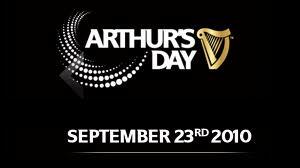 If you enjoy paying over the odds for alcohol sponsored music mayhem then Arthur’s day is for you. group of people who weathered the rain. To Arthur! Until next year that is!